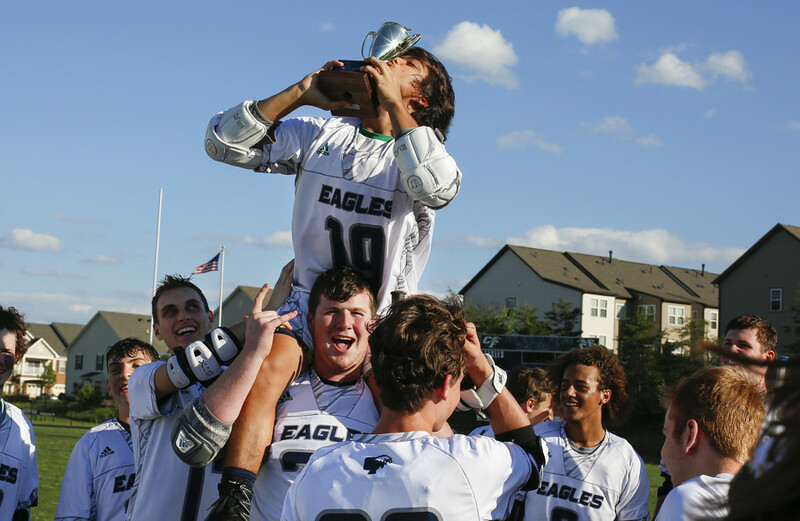 CAPTION: Colonial Forge's Justin Breslin kisses the trophy after Forge defeated Riverbend 11-7 in the Conference 4 final at Colonial Forge High School in Stafford, Va. on May 26, 2017. Thanks for taking the time to do this, Mike. As we talked about previously, I wanted to do something a little different in this interview. instead of only focusing on an image, I thought it would be interesting to explore your return to newspapers and daily journalism. Thank you for the invitation to participate - I think TID is a wonderful resource for the community and one I often turn to for inspiration. To be included is an honor for me! I started at The Free Lance-Star on a temporary basis in 2002. Three months turned into six months and then I was offered a staff position. I worked at the FL-S for 8 years, eventually being named Chief Photographer. In 2010 I was starting to get a little antsy and decided it was time to make a move. I ended up at the Military Times papers, then owned by Gannett, first as a picture editor and after a year or so I jumped into an open staff photographer position. I spent 5 years there and really enjoyed covering all things military but again, the industry was looking bleak. Budgets, including travel, were being cut, good people were losing their jobs and eventually the company was sold. An unexpected opportunity came up as a multimedia producer at the Military Officers Association of America and I thought maybe it was a good time to make the leap. I was really conflicted though- like a lot of photojournalists, I see it as a calling, part of my identity really, but all the industry nonsense was weighing on me and MOAA made me an offer I couldn’t really refuse. I always assumed that the newspaper train would eventually come to a stop and I hoped my Plan B would involve some kind of photography. This looked like an interesting opportunity to focus on video. Like many other newspaper photographers, video was something that I had learned on the job and did in addition to stills. What was the reason that you decided to return to newspapers - it’s not often I see someone leave then return, especially given the difficulty of the industry? 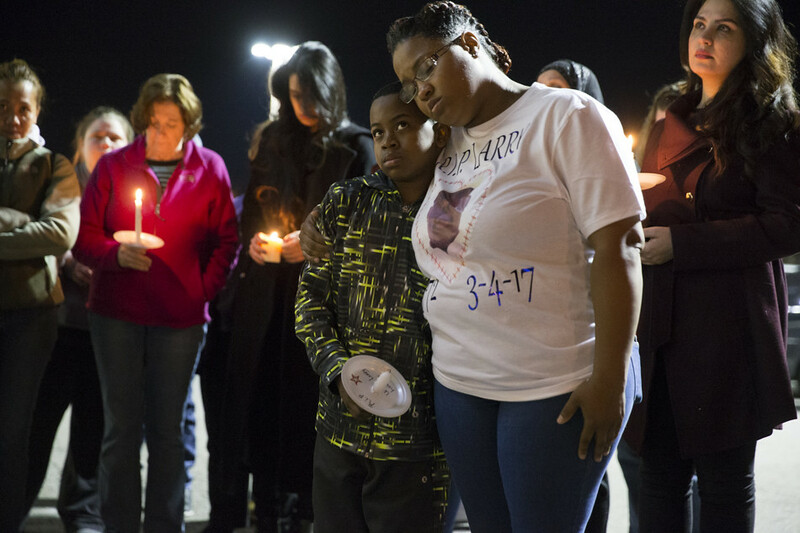 CAPTION: India Myers hugs Malachi Drumgole, 11, during a candlelight vigil honoring his father Larry Drumgole outside Burlington Coat Factory in Fredericksburg, Va. on March 9, 2017. Drumgole, a loss prevention specialist at the Burlington Coat Factory at Potomac Mills, was stabbed and killed by a shoplifter. Drumgole had previously worked at the Fredericksburg store. The short answer is family but after a little while at MOAA I kind of felt like Ray Liotta's character at the end of Goodfellas. He's entered witness protection, completely changed his identity and left all of the excitement of his old life behind. But he was a fish out of water. That's sort of how I felt - no more traveling to interesting places, meeting all kinds of people and often having a front-row seat to history. I was suddenly "just like every other shnook," as Liotta's character said. On the other hand, I had job security, great pay and benefits - all things that are usually lacking in the news business. Plus I was still working with visuals. On paper it was the ideal Plan B.
I had stayed in Fredericksburg after leaving the paper the first time because my wife still worked here and we like the area. Both Military Times and MOAA are about 50 miles away and if anybody reading knows DC traffic, you know those 100 miles every day by car is just soul-crushing and by train it was basically a 4-hour daily commitment. The DoP job unexpectedly opened up at the FL-S and while the timing wasn’t great, I knew that it would afford me more time closer to home. My daughter is entering kindergarten in the fall and I just wanted to be around more and miss less. After six years of making that commute, it was a pretty easy decision. Despite working with a great group of people at MOAA, I wasn't a good fit for the position and came to the conclusion that the financial gain wasn’t worth the time away from my family. Plus I enjoy the unpredictable nature and variety of newspaper photojournalism. 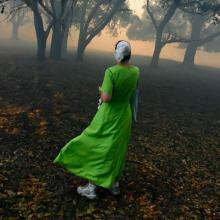 How did your time away influence your impressions of newspapers and daily photojournalism? 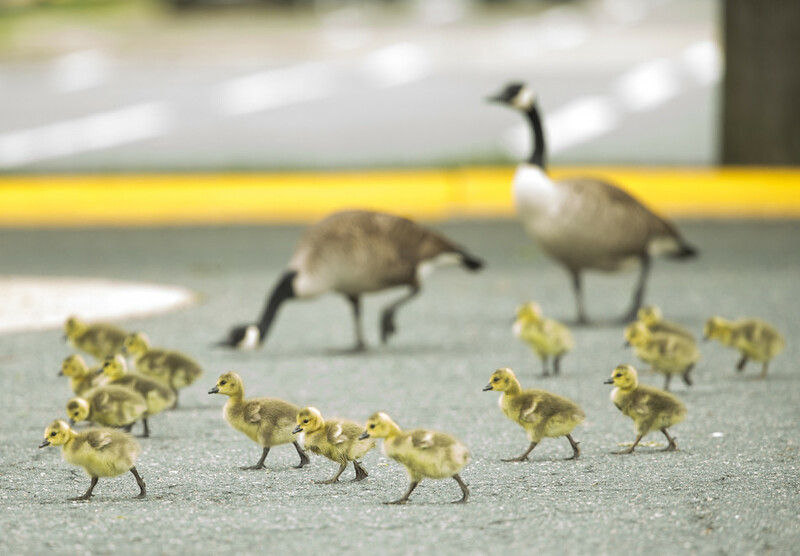 CAPTION: A gander of Canada geese wanders in a parking lot at Central Park in Fredericksburg, Va. on April 26, 2017. We generally plan well enough to avoid the feature hunt, but sometimes as the Marines used to say when I worked for Marine Corps Times, the day's plan often doesn't survive first contact and you need to improvise. Other times, baby geese! My time away from journalism was fairly brief - less than a year - so I’d have to say that little had changed in the big picture sense. It’s inspiring to see what some of the big papers like the Washington Post and New York Times are doing with visual journalism, as well as just investing in their news operations in general, and I was excited to see how I could hopefully make some positive changes upon my return. Also, the political campaigns were really going and there was a lot of rhetoric about the dishonest, fake media and I kept thinking that describes no one I’ve ever worked with. My belief that local journalism is essential to a healthy country was reinforced over and over and I began to wonder if there would ever be a chance to go back or if that door was closed permanently. After all, I was working for an advocacy organization and I was unsure if the tribe would ever let me back in! The staff is significantly smaller than when I left, down to 3 people, including me. Despite my title, I am more like a staff photographer with some added admin duties. In many ways that’s good, though, because I love getting out in the field and working. I am pretty much an introvert but having the camera in hand is essentially a license to meet people i would never have a chance to otherwise. During my time away, the paper went through some hard times, like most every other newspaper in the country. A lot of committed local journalists lost their jobs and the community lost a great deal of institutional knowledge. Warren Buffett’s BH Media bought the paper recently and hopefully that is a positive development but it’s still the newspaper business so there is naturally some stress there. 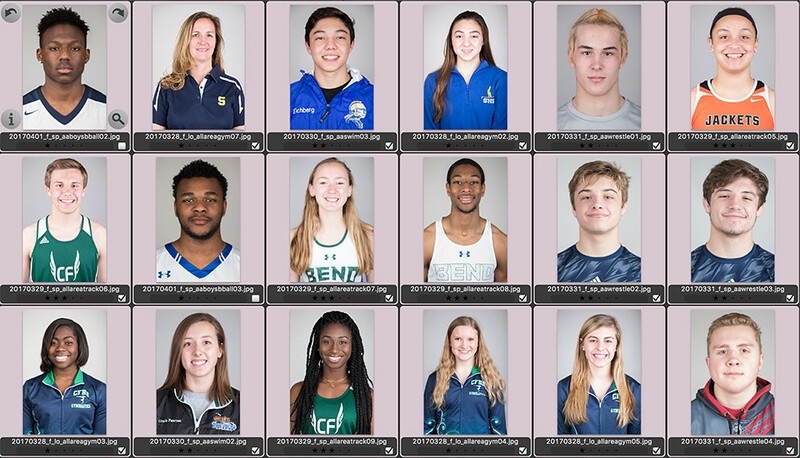 CAPTION: At the end of each high school sports season, we name our All-Area team. There is a sort of cattle call session for all of the athletes at our studio, as seen above, and we also shoot stylized sportraits of the top athletes, usually on location. The people I work with care about the Fredericksburg region and do their best to do the job but it’s tough, especially when you remember how things used to be. I’ve actually been a little surprised by how many people approach me on assignment and ask, "What’s going on at the FL-S? Why has the paper gotten so thin? Why didn’t you cover this or that?" I tell all of them the same thing - yes, we are leaner and yes, we have to make difficult decisions about what we can staff and what we can’t. We are all committed to doing right by our readers but we need them to do right by us and support local journalism. Subscribe to the print product, subscribe to the digital product, support the advertisers, etc. I guess it’s a chicken-and-egg kind of argument but most people seem pretty receptive. What have you learned about yourself from this transition? How do you think you’ve improved because of the time away? Sometimes I think I’m an idealistic idiot and I should have stuck with Plan B! I don’t think I improved much in my time away aside from picking up some technical skills related to video. I did have some time to think about how a newspaper photographer should fit into the newsroom and what we can contribute in this digital-first effort, however. I remain conflicted about video and it's place in a daily newspaper photographer's workflow. On one hand, i see the utility of shooting short clips here and there or short, simple pieces for social media use. On the other hand I firmly believe that nothing good comes of trying to do both at the same time. Like many other aspects of our job, it comes down to availability of resources of which time is the most precious. I would love to have more time to devote to each assignment. I would love more time to revisit assignments to produce good video. It doesn't always happen though. I’ve found for long-term sanity in this business, you really need to be a sort of triage nurse when it comes to assignments. You become adept at identifying what pictures you can devote more time to and those that you just need to shoot and move on. That doesn’t doesn’t mean short-changing the people you are photographing and you should always remain open to serendipity but sometimes a building mug or a portrait will do. I think 10 years ago I might have slapped myself for saying that but that’s where we are given that time is a finite and valuable resource. I don’t see local papers getting an influx of money or going on a hiring spree either but one can always hope! One thing I’ve learned, and this is a process going back years, is that I’m not that great a photographer. I’ve never been able to focus on one long project or exclusively cover sports or politics and be a master of those crafts. However, I am consistent and dependable. I can produce a portrait, chase some spot news and round out my day shooting some sports and you can count that I will do what I can to make them the best pictures possible. For good or ill, the name of the game in daily photojournalism, at least at smaller papers, is whether you can consistently deliver solid images day in and day out. And that’s not to say I don’t stumble. That’s one great thing about daily journalism - tomorrow is another day and an opportunity to improve. Even when I was at Military Times, I really missed the variety that comes with being a general assignment newspaper guy and that was compounded when I went to MOAA. I missed being out in the field, period. Being locked into an office routine felt very alien. One of my photographic heroes is William Albert Allard and every once in a while when I feel like I need some motivation, I watch this video https://youtu.be/ku4tQA_btcM?t=2m6s and I am reminded that we as photographers are indeed lucky to live a life where we see such wonderful things, even if we occasionally miss the shot! Additionally, how do you see your community now that you’ve settled back home? 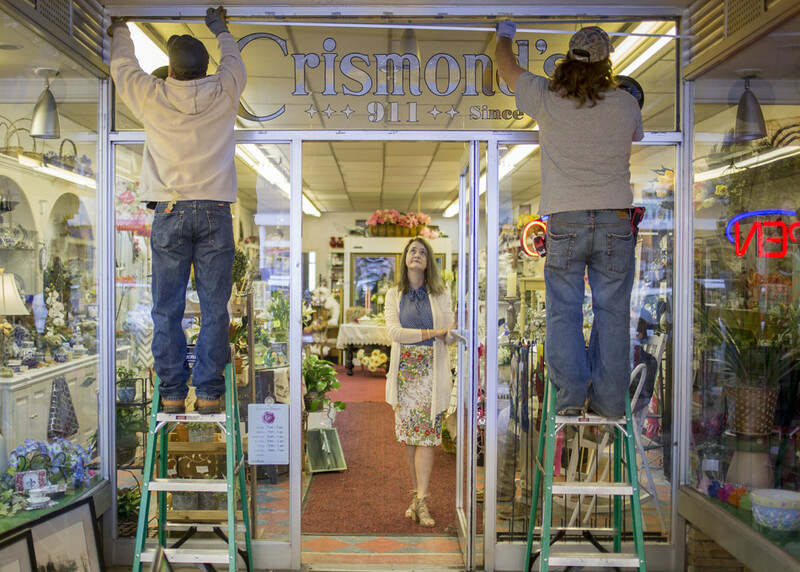 CAPTION: This was for a business story about a window from a landmark Fredericksburg business coming down. We were busy that day and my initial reaction was, "A window? Let the reporter break out the iPhone." I'm glad I reconsidered as the woman in the center of the frame was much more emotional about the window than I could have anticipated. She later told me she bought her first pair of fancy shoes at Crismond's and seeing the sign come down brought back a lot of memories about growing up in Fredericksburg. For one thing, I realized how much I missed when I was commuting up and down the road. You can get into a pattern in life and probably miss a ton of things happening right under your nose. I’m glad I once again get to be an extra set of eyes for people in the area, many of whom probably spent the same if not more time commuting to DC. I am anxious to figure out how to balance projects against daily assignments. Back when we had an enormous staff the FL-S had a reputation for spending time on stuff and getting good results. Those days are long gone and between the three of us, we’re averaging 1-3 assignments a day. I’m optimistic that my staff and I will be able to find away to weave in some more in-depth things into the daily workflow. That’s one of my goals for my first year back, anyway. There's something to be said for living and working in your community. I feel an added connection and a greater sense of responsibility to getting it right. Now, onto the moment. Can you talk about the main image, and the moments that were leading up to it? The assignment was a lacrosse doubleheader at one of our better lacrosse schools. Both the boys and girls teams were pretty good and it was assumed that they would win. During the first game, the lead was switching back and forth and the deciding goal came down to the final minute. Predictably, the girls freaked out and I got a nice reaction picture. The boys game, on the other hand, was over within the first 15-20 minutes so I was not expecting much reaction at all and I figured the reporter was going to lead with the girls game. Long ago I learned the hard way you get there early and you leave late so I hung on to the bitter end. 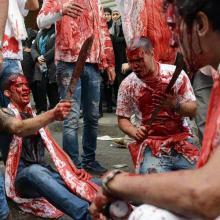 And as I expected, there was not much in the way of celebration. 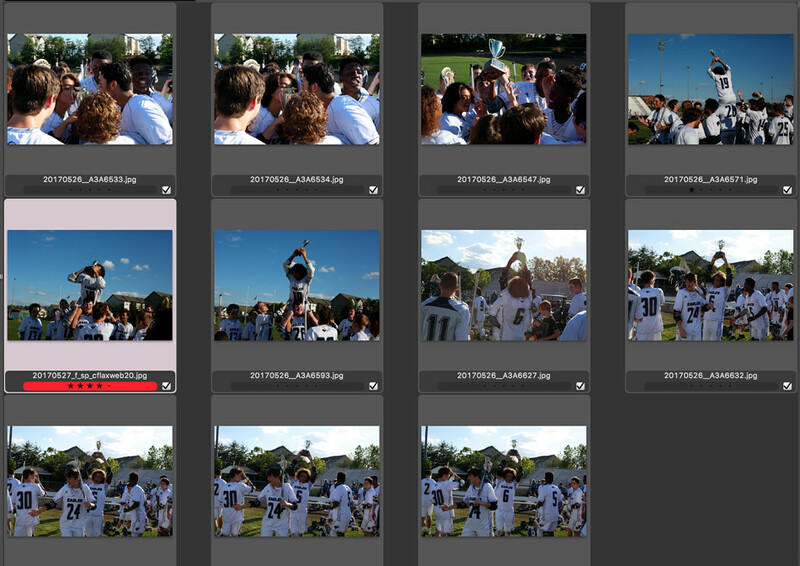 The trophy presentation was disorganized and it didn’t yield much so I figured I was done. One player yells out, “Why do they always give us the broken trophy?” All of the sudden you would have thought they were hoisting the Stanley Cup and the kid gets boosted up but they turn away to face the fans in the stands, leaving me totally out of position. So I quickly make my way around and grab a shot of him just as he’s kissing it and then they let him down. The moment passed and I’m thinking, “Man, I hope that’s in focus.” Well, one frame was sharp and while I wish the kid with his back to me wasn't there, I was happy to come away with something unexpected. I guess the lesson here is in photojournalism as in sports, pay attention to your fundamentals! Now that you’re back and in the full swing of things, what advice could you tell photographers from your experience? One thing I learned from leaving the business is that visual information has never been in more demand, and that the skills we have developed as photojournalists - quickly building rapport, technical mastery and artistic vision among other things - are directly transferable to other industries. 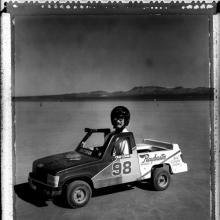 So there is hope for reformed photojournalists to find a good and satisfying Plan B. While my first stab at life after photojournalism didn’t go as planned, I think I have a little more clarity on what’s out there beyond journalism. I'm certainly grateful to have opportunity to be back doing what I love but I am also under no illusions about the state of the industry and how quickly things can change. 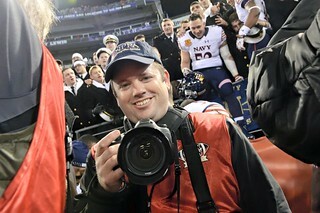 Mike Morones is the Director of Photography at The Free Lance-Star in Fredericksburg, Va.
Mike graduated from Penn State with a degree in telecommunications with no intention of going into broadcasting. He worked for community newspapers in suburban D.C and Va. He spent five years covering the military and defense topics for the Military Times papers before leaving journalism to work for the Military Officers Association of America. Inexplicably, he returned to journalism.